Twenty-four of the North East’s top anglers contested the Winter Pairs at Lochter Fishery in Oldmeldrum on Sunday and when the scores were in it was Andrew Barrowman and partner Paul Sharp who topped the prize list. In testing conditions that were anything but wintery with bright sunshine and only the hint of a breeze, Willie McRobbie had the first fish of the day with his first cast. 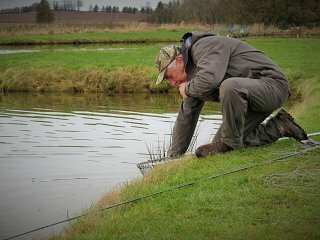 After an early burst of activity the fish were reluctant to chase and static flies became the favoured method to keep trout coming to the net. When the final bell was rung at 2.30pm and the anglers re-paired inside for a well deserved lunch, it was Matt Will and Neal Scowen in second and the McKays, Ernie Snr & Jnr in third. The prize for the last fish going to the experienced Bill Bain. The next competition will be the Rabbie Burns Pairs in January, complete with Haggis, Neeps & Tatties, specially prepared by Lochter’s head chef Bruce. Earlier in the week a wide variety of flies were successful, M. Will had seventeen on buzzers and I. Armstrong nine on the same fly. Okay dokey’s worked for R. West who returned eighteen while black lures were the choice of A. Tweedie who scored fifteen and John Clare who had twelve. Finally the Blobby Boys, Doug & Billy were at it again with a super score of forty-two between them using assorted blobs with a black & white special being the most effective!